Today, the Benjamin Harrison Presidential Dollar Coin remembers when he signed the proclamation for the Pike’s Peak Timber Land Reserve on February 11, 1892. Declaring a Timber Land Reserve, Pike’s Peak, February 11, 1892. Commencing at the north-east corner of Section four (4) Township eleven (11) North, Range sixty-seven (67) West of the Sixth (6th) Principal Meridian; thence proceeding westerly … thence northerly along the Section line to the place of beginning. Provided that this exception shall not continue to apply to any particular tract of land unless the entryman, settler or claimant continues to comply with the law under which the entry, filing, settlement or location was made. Warning is hereby expressly given to all persons not to enter or make settlement upon the tract of land reserved by this proclamation. Done at the City of Washington, this 11th day of February in the year of our Lord, one thousand eight hundred and ninety-two, and of the Independence of the United States the one hundred and sixteenth. Benj. Harrison. James G. Blaine, Secretary of State. The first steps of inquiry into the extent of forest areas of the United States were taken in August, 1876, when Congress, after repeated appeals, called upon the Commissioner of Agriculture for a report upon the timber lands and forest products of the United States. Professor Sargent’s report on the woods and forests of the United States, in the report of the Tenth Census (1880), again called attention to the situation and its needs. A forestry division was established in the Bureau of Agriculture in 1881, but its only work for twelve years has been collecting data, furnishing statistics, and persistently urging and proving the necessity for the Government’s reserving and systematically managing the fraction of forest lands remaining in its possession. Since 1882, the Forestry Division has had encouragement and practical aid from the American Forestry Association, which has regularly memorialized Congress, and through its attorneys argued the Government into reserving a part of its forest lands. The association has membership in thirty-four States, and has been instrumental in the organization of State forestry commissions. Its publications supplement the able reports of Professor B. E. Fernow, and continue a campaign of education and enlightenment. The Timber Culture Laws were repealed by act of Congress, March 3, 1891, and a final clause, which the American Forestry Association has the credit of originating and attaching, provided. Sec. 24. That the President of the United States may, from time to time, set apart and reserve, in any State or Territory having public land bearing forests, any part of the public lands wholly or in part covered with timber or undergrowth, whether of commercial value or not, as public reservations, and the President shall, by public proclamation, declare the establishment of such reservation and the limits thereof. In accordance with this act, Secretary Noble, after investigation by the General Land Office, made recommendations, and President Harrison issued proclamations, withdrawing from entry or sale these fifteen tracts of forest lands, their combined area, exclusive of the Afognak Reserve in Alaska, amounting to about twenty thousand square miles, or about thirteen million acres. Afognak Island, Kadiak Group. Fish-Culture and Timber Reserve. Dec. 24, 1892. Grand Cañon Forest Reserve. In Coconino Co. Feb. 20, 1893. 2,893 square miles, 1,851,520 acres. San Gabriel Time Land Reserve. In Los Angeles and San Bernardino Cos. Dec. 20, 1892. 868 square miles, 555,520 acres. Sierra Forest Reserve. In Mono, Mariposa, Fresno, Tulare, Inyo, and Kern Cos. Feb. 14, 1893. 6,400 square miles, 4,096,000 acres. San Bernardino Forest Reserve. In San Bernardino Co. Feb. 25, 1893. 1,152 square miles, 737,280 acres. Trabuco Cañon Forest Reserve. In Orange Co. Feb. 25, 1893. 78 square miles, 49,920 acres. White River Plateau Timber Land Reserve. In Routt, Rio Blanco, Garfield, and Eagle Cos. Oct. 16, 1891. 1870 square miles, 1,198,080 acres. Pike’s Peak Timber Land Reserve. In El Paso Co. Feb. 11, 1892, and supplemented Mar. 18, 1892. 288 square miles, 184, 320 acres. Plum Creek Timber Land Reserve. In Douglass Co. June 23, 1892. 280 square miles, 172,200 acres. South Platte Forest Reserve. In Park, Jefferson, Summit, and Chaffee Cos. Dec. 9, 1892. 1068 square miles, 683,520 acres. Battlement Mesa Forest Reserve. In Garfield, Mesa, Pitkin, Delta, and Gunnison Cos. Dec. 24, 1892. 1341 square miles, 858,240 acres. Pecos River Forest Reserve. In Santa Fé, San Miguel, Rio Arriba, and Taos Cos. Jan. 11, 1892. 486 square miles, 311,040 acres. Bull Run Timber Land Reserve. In Multnomah, Wasco, and Clackamas Cos. June 17, 1892. 222 square miles, 142,080 acres. Yellowstone National Park Timber Land Reserve. On the South and East of the Yellowstone National Park. March 30, 1891, supplemented Sept. 10, 1891. 1936 square miles, 1,239,040 acres. Actual settlers and miners within the boundaries are not interfered with, but as such reservation prevents any additions to the little communities, these pioneers will naturally be inclined to seek more populous neighborhoods. While the natural scenery and the wild game are preserved as in a national park, the proper administration and preservation of these protective and economic forests will benefit the adjoining regions, and their treatment upon the best economic principles furnish object-lessons to private owners of forest lands. 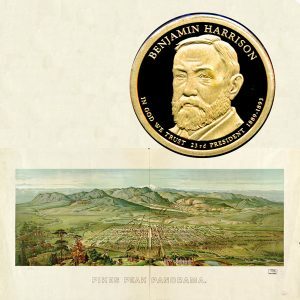 The Benjamin Harrison Presidential Dollar Coin shows with a panoramic view of the Pike’s Peak area, circa 1890.